EXAIRs High Lift Reversible Drum Vac is ideal for the recovery of fluids like: coolant, hydraulic oils, sludge and chips, waste water, tramp oil and liquid spills. The High Lift Reversible Drum Vac has been engineered to recover liquids found within below grade sumps, wells, underground tanks, pits and drains with up to 15 feet of lift. The High Lift Reversible Drum Vac’s powerful vacuum can fill a 55 gallon drum in just 85 seconds from 15 feet and, with the turn of a knob, the same stainless steel pump can quickly empty the drum. Since the High Lift Reversible Drum Vac is powered by compressed air, it has no electric motor to wear out and has no impellers to clog. In fact, the High Lift Reversible Drum Vac has no moving parts, assuring maintenance free operation. It is designed for continuous and heavy duty applications where electric vacuums fail, and can also be used for lighter duty applications. 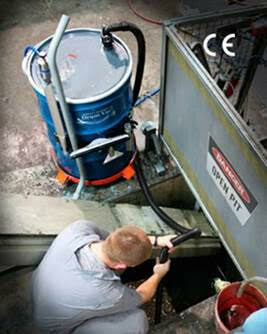 The CE compliant High Lift Reversible Drum Vac attaches quickly to any closed head 30, 55 or 110 gallon drum. High Lift Reversible Drum Vac Systems include the two-way pump assembly, 20 feet (3m) flexible vacuum hose (1-1/2 inch/ .38mm I.D.) with 90 degree quick release elbow connection and one aluminum wand. Deluxe Systems add a drum dolly, heavy duty aluminum tools and tool holder. Premium Systems also include a 30, 55 or 110 gallon drum. Prices start at $607.